A truly unique brand doesn’t stand out with its looks alone: language is also a major differentiation factor. Creating and developing a verbal identity is not easy, especially when multiple editors or orators are speaking on your behalf. Using the methodology developed by Enigma, you will be able to speak in a manner that is exclusively yours! When we talk about our branding projects, people often think: “Oh, you create logos”. Obviously, in our society of images, it is easy to think everything relies on visual. And yet, branding is not a logo, millimetres or Pantone codes. Instead, it is more a state of mind, values … in short, a personality. As for people, a brand personality expresses in many ways: opinions, actions, behaviours, relationship to danger or novelty. And of course, in appearance and language. At Enigma, we help our clients to be exceptional and show it. Being exceptional first means being different and unique. Each time we create or redefine a brand, we base our work on our Creative Footprint methodology to understand its deep personality. This first step enables us to grasp the deep motivations of the organisation (its Why) or the story she should relate. It’s only once these elements are set that we can start working on the creation to convey the visual and the verbal aspects of this brand. Take British online retailer Firebox for instance. You visit them when you want to “Shop for the unusual”. Their product descriptions are smashing. Whether it’s their Dinosaur bottle opener (“its arms may be pathetically short but this T-rex makes quick work of your bottle caps. With its stylish looks and impressive heft, this is more than just a mere bottle opener. A door stop? A paper weight? A book end? A creative murder weapon? 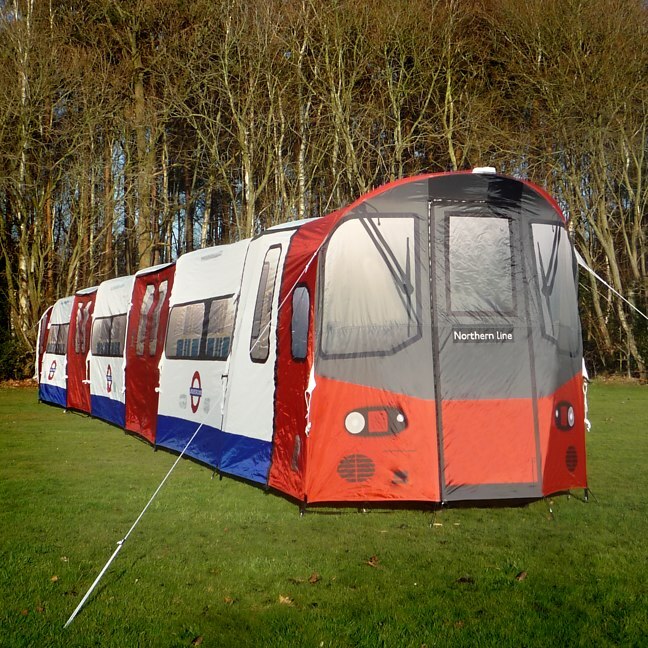 * You decide.”), their London Underground Tent (see image) or their website FAQ section, they consistently use an informal tone filled with nonsense only the British are capable of. How to build a brand rhetoric? While we were proceeding to our own re-branding, in summer 2016, we developed a methodology in this field. Previously, the Enigma brand was built on the “Outlaw” archetype, an agency that rebelled against the established order and didn’t hesitate to destroy what wasn’t working. From now on, we are the Explorer. We seek, study and map the new management, innovation and strategy territories of the 21st century. Let’s say that the youthful energy and idealism left room for a certain wisdom tinged with humility: there’s still so much to discover! First, we position the brand and its competitors according to two axes that we adapt according to the sector of activity: to be unique, a brand must surprise and differentiate itself in regards to the market and also to what we expect of her. Should we use a formal or a colloquial language? Can we take the liberty of adding a touch of humor? Active or passive? All these questions of style will impact the perception of a brand through its language. It is therefore essential to define your own style in order to remain consistent over time or between several editors. Friendly conversational, with a few touches revealing the witty smartasses we are underneath. Also, an occasional en français dans le texte or Swiss German words casually slipped in to celebrate our origins. At Enigma, we don’t talk about our colleagues, but about our “teammates”. We don’t have premises or offices, but “base camps”. We don’t end our emails by “best regards”, but by “keep smiling”, “keep exploring” or other variations around the same theme. In our opinion, the best way to implement the brand’s editorial style is to develop a short lexicon of the most frequently used words and expressions in order to ensure coherence and consistency. Obviously, this lexicon broadens over time. But we have to be careful: the quest for coherence shouldn’t create a rigid and monolithic language. So, what do you think? If you also want to give your brand a unique voice, if you want to stand out and differentiate yourself from the competition, it’s time to pay attention to the way you express yourself. To work less based on gut feeling and set up a real verbal identity, don’t hesitate to contact us: we’ll be pleased to help you! A former business law specialist, Romain Pittet began his journey in corporate communications in the early 00’s. Since then, he’s acquired an extensive experience of all communications-related activities: from branding to digital and social media, from advertising to events, sponsoring and PR. He loves to tell stories connecting brands and consumers.